Coming up this week we are excited to have GM Greg Henderson the founder of Diamondback Eskrima. Grand Master Greg Henderson whom has been involved in FMA (Filipino Martial Arts) for over 50 years. As one of the founding members of WEKAF (World Eskrima Kali Arnis Federation), he is also known as the 'Father of Filipino Martial Arts in New Zealand'. The list of instructors whom he has the opportunity to train with are impressive and frequently named as the who's who in the FMA world. He was also the only Westerner to ever been accepted as an indoor disciple of GM Eulogio "Yoling" Canete, the founding member of Labangon Fencing Club and the now famous Doce Pares whom he was the President from 1932 to his passing away in 1988. GM Ernesto. 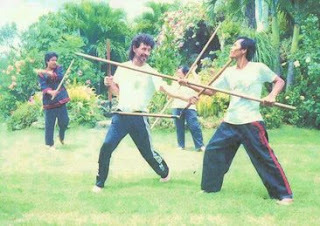 Y. Berdin, founder of the Magkuno style, is credited as being the main influence in GM Greg's FMA training that lead to the development of the Diamondback system. Grand Master Greg Henderson also trained with GM Abner Pasa, the successor of GM Eulogio Canete's Larga Mano system whom was gracious to allow GM Greg to live and train full time with him to complete his study of Eulogio's system. Currently, GM Greg Henderson teaches privately to a dedicated group of private students whom train in his backyard. They are being groomed to be future instructors. Most of his students are either experienced martial artist from other disciplines or instructors in their own right.